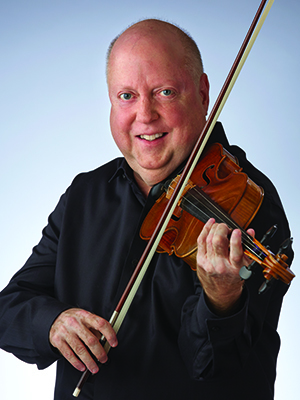 Philip Palermo joined the Indianapolis Symphony Orchestra in January 1985, following in the footsteps of his father, George, who had been a member of the ISO 1938-40. A native of Barrington, Illinois, he studied violin with his father as well as Morris Gomberg, Franco Gulli and Dorothy DeLay. He made his concerto debut with the Chicago Symphony at age 15 and has appeared as soloist with the Pittsburgh, Baltimore, Houston and Milwaukee symphony orchestras in addition to numerous times with the ISO. Palermo is artist in residence at the University of Indianapolis and is heard regularly with the Ronen Chamber Ensemble and the Canale Quartet. A recitalist in many countries throughout Europe and numerous parts of the United States, he participates in music festivals from San Diego to Maine and enjoys tennis and high performance automobiles.